Increase in patient population, rise in demand for customized knee implants, and surge in government initiatives to drive the global joint replacement devices market. However, product recalls by the Food and Drug Administration and other regulatory authorities and increase awareness about alternative treatments are major factors restraining the global market. Based on product, the global joint replacement devices market has been segmented into knee reconstruction devices, hip reconstruction devices, and extremity reconstruction devices. The knee reconstruction devices segment is projected to account for a major share of the market by the end of the forecast period. Increase in the number of total knee replacement (TKR) surgeries and launch of knee implants for total and partial knee replacement surgeries are anticipated to propel the knee reconstruction devices segment during the forecast period. In terms of type of fixation, the global market has been classified into cementless, cemented, and hybrid. The cementless fixation segment is anticipated to dominate the global joint replacement devices market owing to the increase in demand for cementless joint replacement surgeries and rise in the number for surgeons preferring these surgeries. Based on technique, the joint replacement devices market has been divided into traditional surgery, minimally invasive surgery (MIS), and computer-assisted surgery (CAS). The MIS segment is projected to expand at a rapid pace due to increasing adoption of this technique for replacing joints and rising awareness about the advantages of MIS. In terms of indication, the joint replacement devices market has been segregated into osteoarthritis, rheumatoid arthritis, hip dysplasia, orthopedic trauma, joint stiffness, and others. The osteoarthritis segment is expected to hold a dominant share of the market during the forecast due to the increase in prevalence of osteoarthritis and rise in the number of patients with osteoarthritis opting for joint replacement surgeries. Based on end-user, the joint replacement devices market has been categorized into hospitals, orthopedic clinics, and ambulatory surgical centers. The ambulatory surgical centers segment is estimated to expand at a substantial pace during the forecast period. Rapid expansion of the segment is attributed to the increase in number of patients preferring ambulatory surgical centers for surgeries due to short waiting time and hospital stay. In terms of region, the global joint replacement devices market has been split into North America, Europe, Asia Pacific, Latin America, and Middle East & Africa. North America accounted for a major share of the global market in 2017. Presence of established market players, rapid adoption of technology, and surge launch of new products are anticipated to drive the market in the region during the forecast period. Rise in prevalence of orthopedic disorders requiring joint replacements and increase in geriatric population in emerging economies such as China, India, and Australia are anticipated to fuel the market in Asia Pacific. Additionally, price caps on knee implants by government authorities, increase in health care expenditure, and rise in the number of mergers & acquisitions are expected to propel the market. 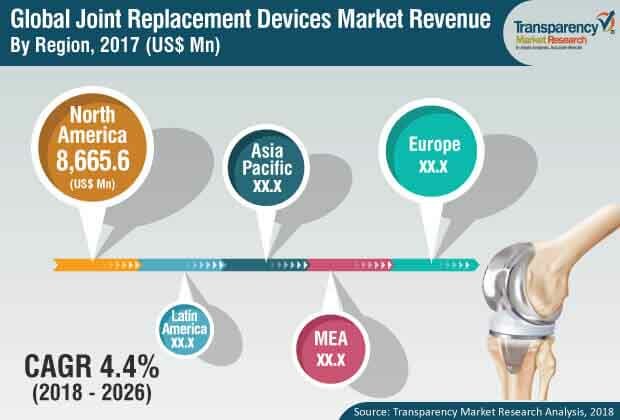 The joint replacement devices market in Latin America and Middle East & Africa is driven by the rise in government initiatives for providing cost-effective treatments for orthopedic disorders and availability of orthopedic care services in various countries. Furthermore, focus on strengthening the health care system to provide quality care in countries such as UAE and Saudi Arabia is expected to create opportunities in the market. Major players operating in the global joint replacement devices market include Aesculap Implant Systems, Arthrex, Inc., ConforMIS, DePuy Synthes (a Johnson & Johnson Company), DJO Global, Exactech, Inc., Medtronic, Smith & Nephew, Stryker, and Zimmer Biomet. Focus on developing orthopedic solutions through technological advancements, increase in adoption of inorganic strategies such as mergers & acquisition, and new product development are expected to drive the global market during the forecast period. In March 2018, Smith & Nephew plc launched JOURNEY II XR, a total knee arthroplasty in the U.S. and Japan. This report analyzes the current and future scenario of the global joint replacement devices market. Increase in prevalence of orthopedic disorders such as osteoarthritis and rheumatoid arthritis, rise in demand for orthopedic devices, and new product launches are projected to drive the global joint replacement devices market during the forecast period. Additionally, rise in geriatric population, increase in prevalence of obesity, and surge in the number of specialty care centers propel the joint replacement devices market. The global joint replacement devices market report comprises an elaborate executive summary, which includes information about various segments of the market. It also provides information and data analysis of the global market with respect to the segments based on product, type of fixation, technique, indication, end-user, and region. A detailed qualitative analysis of drivers and restraints of the market and opportunities has been provided in the market overview section. Additionally, the section comprises competitive matrix and company profiles along with business overview to understand the competitive landscape in the market. This section of the report also provides market attractiveness analysis by region and market share analysis by key players, thereby presenting a thorough analysis of the overall competitive scenario in the global joint replacement devices market. Based on product, the global joint replacement devices market has been segmented into knee reconstruction devices, hip reconstruction devices, and extremity reconstruction devices. These segments have been analyzed based on the available joint replacement devices used during joint replacement surgeries for the treatment of orthopedic disorders such as osteoarthritis. These products are preferred by surgeons in hospitals, as these are cost-effective and are ease to handle during surgeries. In terms of type of fixation, the global market has been classified into cementless, cemented, and hybrid. Based on technique, the joint replacement devices market has been segregated into traditional surgery, minimally invasive surgery (MIS), and computer-assisted surgery (CAS). In terms of indication, the market has been divided into osteoarthritis, rheumatoid arthritis, hip dysplasia, orthopedic trauma, joint stiffness, and others. Based on end-user, the market has been categorized into hospitals, orthopedic clinics, and ambulatory surgical centers. The market size and forecast for each of these segments have been provided for the period from 2016 to 2026, along with their respective CAGRs for the forecast period from 2018 to 2026, considering 2017 as the base year. In terms of region, the global joint replacement devices market has been split into North America (the U.S. and Canada), Europe (the U.K., Germany, France, Spain, Italy, and Rest of Europe), Asia Pacific (India, China, Japan, Australia & New Zealand, and Rest of Asia Pacific), Latin America (Brazil, Mexico, and Rest of Latin America), and Middle East & Africa (South Africa, GCC Countries, Israel, and Rest of Middle East & Africa). The market size and forecast for each of these regions and the mentioned countries have been provided for the period from 2016 to 2026, along with their respective CAGRs for the forecast period from 2018 to 2026, considering 2017 as the base year. The research study also covers the competitive scenario in these regions. The report also profiles major players in the global joint replacement devices market based on various attributes such as company overview, financial overview, product portfolio, business strategies, and recent developments. Major players profiled in the report include Aesculap Implant Systems, Arthrex, Inc., ConforMIS, DePuy Synthes (a Johnson & Johnson Company), DJO Global, Exactech, Inc., Medtronic, Smith & Nephew, Stryker, and Zimmer Biomet.